Eldar Aliev understood early on that his main task in putting Le Corsaire onstage was to bring some sense of coherence to a crazy, convoluted story. Now, as he finishes his work with Colorado Ballet's production, opening Friday at the Ellie Caulkins Opera House, the Russian-born former dancer is content, considering what he had to work with. "Staging it was a mess," the guest choreographer said during a rehearsal break at company headquarters. "There was never any logic in the production, and there still isn't. I just wanted to be consistent, and I think I've done that." Aliev appeared in the Kirov Ballet's production during the 13-year stretch he served the St. Petersburg company as a principal dancer. After settling in America in 1992, he became artistic director of Ballet Internationale in Indianapolis and in 2005 created a slimmed-down version of Corsaire. The unwieldy story was simplified, the three acts trimmed to two. And Aliev replaced endless stretches of mime with dancing. "The Kirov had revived it in 1986, but in that one, poor Conrad had very little dancing. The title character! My Conrad is loaded with dancing. "I wanted to illustrate his qualities. Now, we can see his leadership in the opening scene, his romantic side in the jardin (garden) scene and in the famous pas de deux, I show him as a passionate, loving man." That duet, made famous by Rudolf Nureyev and Margot Fonteyn (and danced by hundreds of others since), originally paired Conrad with a slave girl. In Aliev's staging, the pirate partners his beloved Medora. Such changes are necessary to bring an audience closer to the characters, he stressed. But Aliev also maintains deep respect for the storied traditions of Russian ballet. "I'm trying to keep this pure," he said. "The Kirov style brings an energy to the stage that we call spirit. We always felt that you had to believe the characters onstage. "The Kirov way took the best of the three (European) styles - the French, Italian and the (Danish) Bournonville. But more recently, there have been changes in ballet that we also need to incorporate, like those introduced by Balanchine and others. "Ballet cannot live in a museum. If there is no progress, it becomes stagnant and will die. Lady Caroline Lamb famously described the English poet Lord Byron as "mad, bad and dangerous to know," words that could also describe Conrad, the hero of his epic poem The Corsair. The handsome Byron (1788-1824, real name George Gordon) certainly did "know" the ladies, finding particular pleasure in the chase. For most of his brief life, he enjoyed considerable fame as a poet. When Corsair was published in 1814, its run of 10,000 copies sold out the first day, reaching 25,000 in sales the first month. The tragic poem contrasts with the ballet's happy ending: In the Byron, Conrad learns that his love, Medora, has perished in captivity. The poet was a hopeless romantic - witness his famous line, "She walks in beauty like the night." He was a lover and a fighter, despite being born with a club foot. He traveled constantly through Europe and took up arms with groups battling for freedom in Italy and Greece. The French composer Hector Berlioz was among those who loved The Corsair and its swashbuckling hero: "I adored this man's character," he wrote, "at once inexorable and gentle, pitiless and generous, a strange blend of two seemingly contradictory feelings, hatred of humanity and love for a woman." Berlioz later composed a Corsaire Overture, which had no connection to Byron's work.  Synopsis: A group of pirates sails into port and greets their leader, Conrad. In the Greek marketplace, the Seid Pasha, a rich aristocrat, enters as an auction of slave girls begins. The Pasha and Conrad are captivated by Medora, who is purchased by the wealthy slave owner, along with another girl, Gulnara. Back in his hideout, Conrad dreams of a garden in which Medora is the loveliest flower. Awakening, he vows to find her. Conrad sneaks into the Pasha's palace and, with the help of Gulnara, escapes with Medora. Back in the grotto with Conrad's pirate band, the couple celebrates their love and newfound freedom.  History: Premiered in Paris in 1856, the three-act ballet has been recast and revised numerous times, including five stagings by the legendary Marius Petipa. The work was little-known in the West during the last century, except for several scenes excised as stand-alone pieces (notably the bravura pas de deux). Long a staple of the Bolshoi and Kirov ballets in Russia, Corsaire made a splash with a production staged by American Ballet Theatre in 1998. 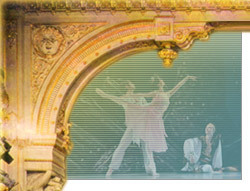  Of note: Colorado Ballet opens the 2007-08 season with the classic saga of pirates and harem girls.